May Day has been an important festival throughout history. 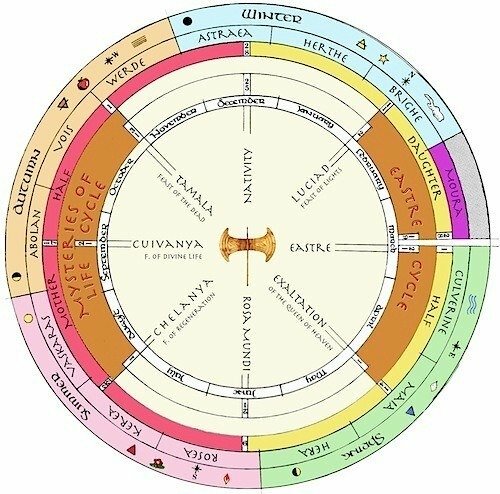 Its significance in the wheel of the year is not that it is the first of the month (the same day was celebrated when calendars were different). Its real significance is that it is the cross-quarter day between the Spring Equinox (Eastre) and the Summer Solstice (Rosa Mundi). In the Faith of Our Mother God, it falls exactly in the middle of the month of Maia, and is the day of the Exaltation of the Queen of Heaven (sometimes called the Coronation). Despite long millennia of patriarchal religion, traditional May Day celebrations reflect this true meaning of May Day. The most notable of these are the crowning of the May Queen and the Maypole Dance. The significance of the crowning of the May Queen is obvious as a re-enactment of the coronation of the Queen of Heaven. It is also clear why the May Queen must be a virgin. To understand the meaning of the beautiful May Day Maypole tradition, we have to go a little deeper into the spiritual meaning of this beautiful festival. These three titles are enacted in the Eastre Cycle, culminating in the Feast of the Exaltation. And they may also be understood in terms of the World Axis, which passes through the Three Worlds of Heaven, Earth and the Netherworld. As sacrificial Priestess, Our Lady descends into the Netherworld in the Eastre Event and is slain and hanged, as the Scriptures quite specifically state "upon the pillar of the world". Thus the first of her Sacred functions takes place at the lowest point of the World Axis. After Her resurrection, she returns to the Middle World (where she first came at her earthly birthtime of Nativity) and takes up her full royalty as Princess of the World. This is celebrated on The Day of Our Sovereign Lady (Culverine 5th/March 25th). Here she stands at the center of the Middle World (upon the Axis) as its ruler. 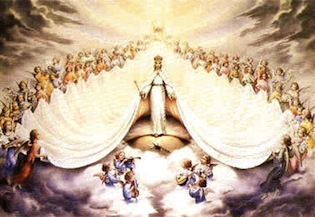 Finally, at the completion of the Eastre Cycle on the May Day festival of the Exaltation, She ascends to the Upper World, where she is crowned Queen of Heaven. But She is still Princess of the Earth and rules the world through Her Golden Order or thamë. When we understand this, we can also understand the ancient May Day Maypole Dance. The pole, of course, represents the world axis itself. It is often crowned with flowers, because the place of Our Lady is now at the summit of the World-Axis, from whence She reigns over earth and heaven. Her rulership is depicted in the colored ribbons that extend from the (crowned) summit of the World-Axis to the plane of Middle World. The different colors of the ribbons depict the different "qualities" of material existence. These qualities, as they emanate from their Divine Source are perfect Archetypes (pure colors). As they reach the children of the earth, the "streams" or ribbons are carried in the dance in which they are woven and unwoven in intricate patterns, which represent on one level the Sacred Dance of the Celestial Order, or thamë, reflected on earth; and on another level the entanglements of werde. In this context it is important to remember that Sai Thamë is said to be the mother of the Werdes and that the month of Maia begins with Maia's Day, the day of the first of the Werdes and in a certain sense, the true May Day. The name Maia/May comes from a root that gives us words like "majesty", "magic" and "might". It also gives us "maid" – the feminine name for humanity as a whole. This is the month in which Our Lady's sacrifice and triumphant resurrection spread out into the middle world, the world of maid, as She takes Her place at the summit of Her Mother's creation. 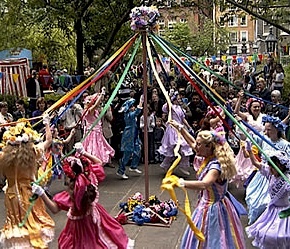 The Maypole Dance is a dance in celebration of Her enthronement, and also of its effect on ourselves (maid). Each of us is connected to Her. Each of us is the terminal point of a stream that has its source in Her; a thread that leads back to the absolute Center of all being. 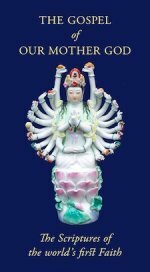 If each individual fulfills her part in the Celestial Dance, never forgetting her essential attachment to the Center, then the Golden Order of Heaven is reflected on the Middle World below. The title Queen of Heaven is of great antiquity. Not only was it used by the ancient Hebrews who refused to convert to the new masculine cult (Jeremiah 7:18) and of numerous other "goddesses" throughout the world, but we see in iconography from ancient sites that the supreme Deity was a Heavenly Mother. Only in later patriarchal cults was the Heaven/Sky function usurped by masculine "gods" and the feminine principle relegated to an "earth mother". In the earliest religion, Our Lady is both Princess of the Earth and Queen of Heaven, but Her highest and definitive title is Queen of Heaven. The re-adoption of this title by the Catholic Church was simply the acceptance of an Archetypal Reality that was too strong to resist: one that goes into the deepest roots of the human psyche and of cosmic reality itself. 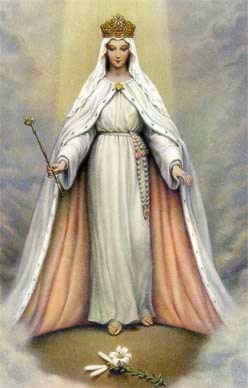 It is no coincidence that having re-acclaimed the Queen of Heaven, the Church should also dedicate May as Mary's month. 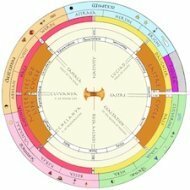 In terms of the Wheel of the Year, the Exaltation of the Queen of Heaven represents the final and culminating festival of the quarter-year Eastre Cycle. It is also the final High Feast of the Daughter Half of the year. However, while the Eastre Cycle ends on this day, the Daughter Half continues for another six weeks until the High Feast of Rosa Mundi, the first festival of the Mother Half. Like the period leading up to Nativity (the Festival that ends the Mother Half), this final phase of the Daughter Half is seen as a Mother/Daughter period. The Daughter is now reunited with Heaven (and therefore with Her Mother) after Her descent to Earth at Nativity. The parallel early winter festivals that come at the end of the Mother Half, while centering on the Mother, are concerned with the coming of the Daughter.